Charley Murfitt. Community Engagement Trainee, Palace House. Two exhibitions related to sporting art are currently in London Museums. 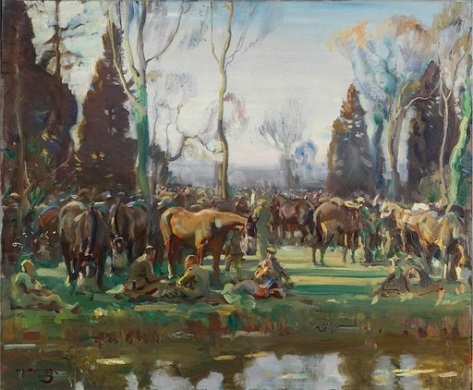 The first of which is the Alfred Munnings exhibition: ‘Memory, the War Horse and Canadians in 1918’ which is currently held at the National Army Museum; and Edwin Landseer’s ‘Monarch of the Glenn’ at the National Gallery. I thoroughly enjoyed this exhibition and found myself engrossed in it as I walked round it; it subverted my expectations of war time art and its depiction as, in the Munnings Exhibition, the horses looked healthy, the buildings, albeit in some state of ruin, looked untouched as though they’d fallen apart due to the neglect, not a destruction of war. The paintings and the exhibition had a sense of calm surrounding them making it seem docile and removed from the setting of war. The layout of the exhibition flowed well round the space and I found the grey background behind the gold frames striking. The Monarch of the Glen was a different story. As a young person, I usually wouldn’t have attended a lecture to preface an exhibition. I would access additional information online, through a blog or a podcast. It was clearly aimed at an older audience and not my age group. I’m sure to any other audience member of this lecture found it was interesting and engaging however as a young person I’m not used to information in this format and found it quite the opposite. The small side room seemed bursting at the seams with people rather than art.The movement of people was stagnant as everyone made a b line to the middle of the room neglecting his other works that cowered at the corners of the room in the shadows of the main attraction. Unlike Munnings, the Monarch of the Glen lacked any sort of direction or movement round the room. This lead to a chaotic energy surrounding the exhibition, however, as you walked in you couldn’t ignore the stag that sat proudly and imposingly at the end of the room instantly catching you eye as you walked in. Landseer captured the grandeur of this stunning animal flawlessly; you can’t help but stand in awe of this wonderful animal. While an appreciation of Landseer’s work is a must, the exhibition did it no justice. From the perspective of a young adult, British Sporting Art is a large part of our country’s heritage and an important part of British history. To ignore it or hide it is to ignore our country’s history as it continues to be a large part of our history. 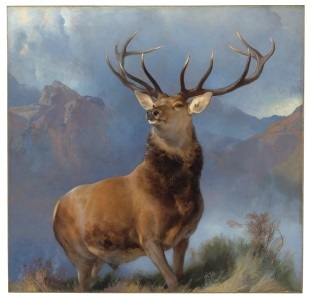 Art is controversial and meant to evoke emotion, spark ideas and opinions; which art like Landseer’s ‘Monarch of the Glen’ most definitely achieves.